• Entertainment shows such as The New Illusions and Raiding the Rock Vault. • Choosing the right tower for you can be confusing. If you want to stay on the south end of the Strip, the Tropicana is an excellent option, providing an updated hotel with competitive prices. Past guests tend to debate the "Club Tower vs Paradise Tower" topic. Both have their pros and cons, and which one to choose depends on your needs. This iconic hotel and casino has been featured in a number of popular movies such as Diamonds are Forever and the Las Vegas sequences of The Godfather. One of the first resorts and casinos on the strip, the TropLV was founded by Ben Jaffee in 1955. It was meant to be a high-end hotel in Las Vegas featuring a Cuban theme. In 2015, Tropicana Las Vegas announced upgraded WiFi technology, which – combined with 100,000 square feet of convention space – will make the competitive an excellent choice for convention goers. Resort Fee: $25. Includes internet access, fitness center, 2 bottles of water per day (by request after check-in), faxes, local and toll calls. Dog friendly. Restrictions apply. Service animals welcome. The video below offers a walk through the Tropicana Las Vegas in March 2015. Bacio® Italian Cuisine: Winner of the 2014 trip advisor certificate of excellence this Italian restaurant was also featured in magazines like Bon Appetit, They serve up such fine Italian faire as Crispy Risotto and Branzino. Raiding the Rock Vault: Voted 2014’s Best of Las Vegas Best Musical, this show features Doug Aldrich of rock powerhouse Whitesnake and hugh McDonald of Bon Jovi. Laugh Factory Las Vegas: The Tropicana Las Vegas is home to the Las Vegas incarnation of this renowned comedy club. The New ILLUSIONS starring Jan Rouven: Awarded the Best Magic Show in 2013 and 2015 by Best of Las Vegas. One of the short-list shows for any visit to Las Vegas. Tropicana Las Vegas is one of the few pre-1989 resorts still standing on the Las Vegas Strip. The property has gone through many changes since its arrival in the late 1950’s, yet it still retains its prime real estate location at Tropicana and Las Vegas Blvd. The “Trop” has endured something of a bad reputation in recent years by those who stayed there prior to its 2011 makeover. Prior to that time, the hotel was starting to show its age. Its recent upgrades have brought it back to a competitive level with the other resorts on that iconic intersection. Recent traveler reviews express surprise at how nice the property is. Indeed, I walked through the property in March 2015 (see video above), and found it to be clean and modern. As with most of the hotels on The Strip, I have also stayed at the Tropicana, and found the price-to-location ratio to be the best of the four resorts at that intersection. TropLV has always been known for its smaller old-school Vegas lounge and entertainment shows, and several offerings such as the Laugh Factory and Raiding the Rock Vault provide ample options for guests and walk through traffic alike. If you want to stay on the south end of the Strip, this hotel is an excellent option, providing an updated hotel with competitive prices. Past guests tend to debate the “Club Tower vs Paradise Tower” topic. Both have their pros and cons, and which one to choose depends on your needs (see tips below). I would like to thank Tropicana Las Vegas for providing me with additional, updated information for this review. Strip views in high rooms are considered the best among standard rooms. Club Tower vs Paradise Tower? 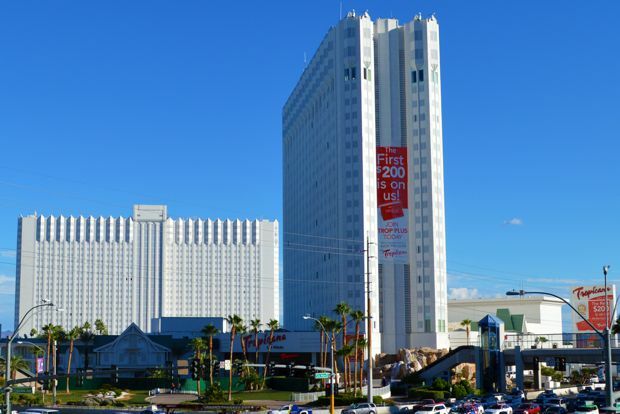 Club Tower rooms are quieter (at the back), but require a longer walk to get to the Strip. Paradise Tower is closer to the casino area (at the front), but can be noisier. The map below shows the location of the Tropicana Las Vegas, where it has stood for decades.